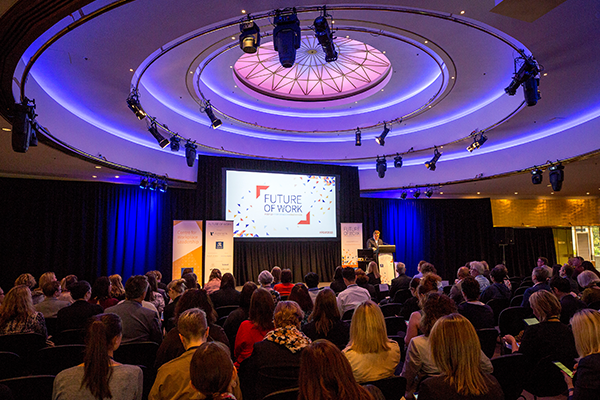 Highlights from the 2018 Future of Work Conference provide insight on some of the key challenges and opportunities facing, employees, managers and organisations. By 2022, 50 per cent of all jobs will require retraining according to the World Economic Forum. The fact this is a mere three years away is turning up the heat on the discussions around the future of work. For the first time, four generations are working side by side; we are more globally connected than ever before and new technology is paving the way for robot workers and driverless cars. 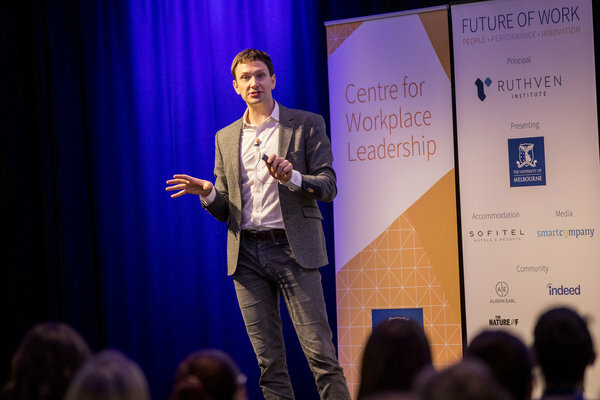 Experts took a deep dive into the associated challenges and opportunities at the Centre for Workplace Leadership’s Future of Work Conference. Opening the conference with a clear message, Jenn Gustetic, digitalHKS research fellow at Harvard Kennedy School said: “The future of work is already here and it is changing the world in phenomenal ways”. Gustetic highlighted the “-athon” culture in the United States, with the likes of hackathons and jamathons giving innovative problem solvers a unique opportunity to tap into new technology and think about old problems in new ways to improve how we live. “Humans naturally have a problem-solving mindset,” said Gustetic, who is also Program Executive for Small Business Innovation Research at NASA. "Innately human traits like problem solving and empathy will ensure people always remain at the centre of work." Through emotive story-telling, Gustetic reminded the audience of the African ebola outbreak in 2014 and the heat exhaustion experienced by medical staff and volunteers because of the protective suits they wore. A jamathon to address this problem unearthed wedding dress designer Jill Andrews, whose unique perspective helped deliver a winning product. This multi-disciplinary team provided a great example of what Gustetic called ‘human-machine collaboration’. The role of managers will also shift dramatically in coming years. 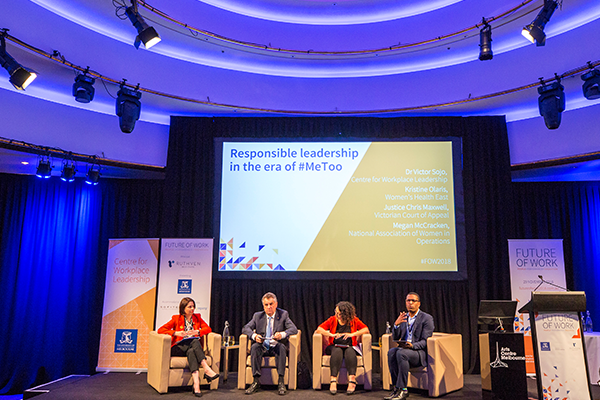 Director of the Centre for Workplace Leadership at the University of Melbourne, Thomas Maak, elaborated on the role of the manager and the importance of moral and responsible leadership. “It takes responsible leadership to solve the pressing problems we face, in particular the rise of the working poor and the super rich,” said Maak. “Responsible leaders should be authentic,” said Maak. Maak also argued for a rethinking of the Universal Basic Income, which he said was especially salient now with the potential of decreased income in the jobs of the future. The #MeToo panel focused on practical steps to make sexual harassment a thing of the past. The panellists agreed that ending sexual harassment requires an organisational level discussion. Individual behaviour needs to change but so too do the processes and procedures for dealing with complaints. Organisational culture needs to change, and it was clear that this will be more difficult in some industries than others. The panel further highlighted the important role people who witness harassment or bullying can play. It might be as simple as saying “What do you mean by that?”. And the biggest challenge? According to Megan McCracken, Chair National Association of Women in Operations, it will be helping businesses understand the cost of not doing something about sexual harassment in the workplace. Even with the best intentions we are often reinforcing the status quo said Dr Victor Sojo from the Centre of Workplace Leadership. The pressure will be on for companies to take more of an external stance on such social issues. Robert Hillard from Deloitte and Peter Quigley from Westport Water joined Associate Professor Susan Ainsworth to discuss the rise of company advocacy. They outlined the risks for companies taking a stance of issues particularly when their customer base is split on the topic. But, the message was clear: Be true to your company values. With echoes of Maak’s earlier call for authentic leaders, Hillard said: “It’s impossible for a leader to stand in front of an organisation and say ‘we are doing X’ if it’s not supporting the vision of the business. Common across all our sessions was a central theme: We must be active agents in the future of work – both as individuals and organisations. As Chris Kurtana, a fellow at the University of Oxford put it: “We need to become powerfully self-aware to understand the future of work”. He argued that there are two futures – the one we can see, and the one we can’t, using global examples of economic and political predictions that fell far short of the mark, such as the latest US Presidential election. 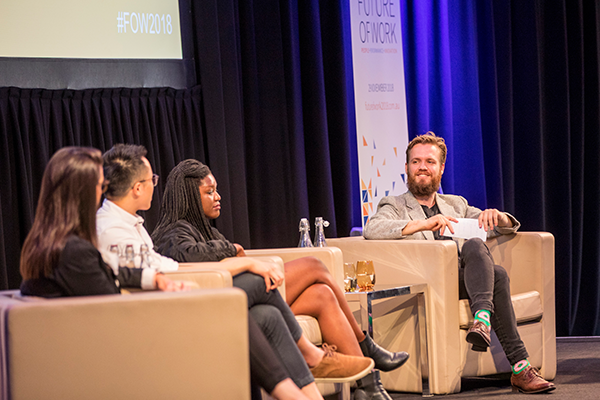 Get the full picture: Future of Work 2018 was brimming with panels and workshops on a huge variety of topics, only some of which are covered here. Search #FOW2018 to learn more and watch out for information about the 2019 event.